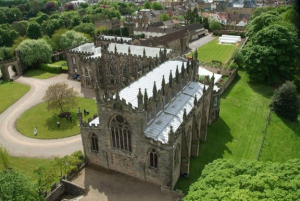 In October 2015, the Curatorial and Exhibitions Director of the Auckland Castle Trust, Dr Chris Ferguson, kindly agreed to lead members of the Society on a tour of the castle, walled garden, and medieval parklands. Originally established as a medieval hunting lodge, Auckland Castle was the country residence of the Prince Bishops of Durham for more than 900 years. The principal seat of the Bishops of Durham from 1832 and still a working episcopal complex today, it was transferred in 2012 to the Auckland Castle Trust. The charitable foundation is restoring both the castle and grounds and establishing permanent exhibitions on the history of faith and Christianity in Britain and the North East of England. The castle is surrounded by 800 acres of parkland originally used by the bishops for hunting, now open to the public and containing seven Grade I listed buildings. Our visit included St Peter’s Chapel, created in the 17th Century from a 12th Century great hall, the Bishop’s state rooms, including the 17th Century Spanish masterpieces by Francisco de Zurbaran, and an exploration of the medieval fabric of the palace. We also enjoyed a behind-the-scenes look at the Medieval kitchens, service wings, 14th Century College buildings, the early Walled Gardens, and some tea and cake!